The Seattle City Council passed the final legislation implementing Mandatory Housing Affordability and the accompanying rezones in CHUV on March 18, 2019. There were no changes made to the maps there were passed out of committee. All maps and documents about MHA and the rezones are available on the City Council’s MHA Committee website. CHUV rezone map – Final. The current map of the amendments as it passed the MHA committee can be viewed and downloaded HERE. Neighbors can contact Councilmember O’Brien’s office with comments about these amendments, including site specific or block amendments or general comments. The final vote of the full City Council will be held March 18, 2019. Councilmember Mike O’Brien introduced proposed amendments (changes) to the CHUV rezone map in mid-January. The map with the proposed legislative amendments is available here. All Amendments passed the City Council MHA committee except amendments 3 and 5 (withdrawn) on February 25, 2019 by a vote of 5 to 3. The proposed amendments that Councilmember O’Brien is offering are more consistent with the broad recommendations from the CHUV Committee for Smart Growth and community feedback. Neighbors can contact Councilmember O’Brien’s office with comments about these amendments, including site specific or block amendments or general comments. Mandatory Housing Affordability (MHA) legislation and rezones of urban villages citywide are scheduled to move forward in the Seattle City Council in spring 2019 with a final vote scheduled in March. 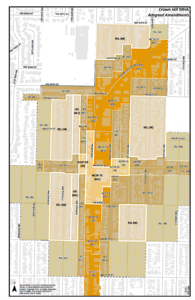 View the preferred map citywide and for Crown Hill Urban Village that was presented by the Mayor’s office to the City Council for all rezones proposed in the City. View the most current zoning descriptions of what kinds of housing the zoning changes could include for areas designated Residential Small Lot (RSL), Lowrise, or higher. The preferred map is the starting point for the Council to offer amendments to tailor zoning proposals in January. A printable copy of Executive Office’s preferred Crown Hill Urban Village map is here. In November 2017, the Office of Planning and Community Development released its preferred alternative zoning recommendations for Crown Hill Urban Village as part of the final Environmental Impact Statement (EIS). View the recommended zoning changes in CHUV and Citywide on this more easily readable interactive map (click Preferred Alternative Map). A printable copy of the CHUV map is here. The City released their summary of community input. View that document here. Read the City’s information about the proposed changes, including frequently asked questions, see examples of proposed housing changes and more HERE. An open house and a public hearing were held in February/March of 2018, and many neighbors testified, wrote and called. Neighbors can still ask questions and voice their opinions about the rezones. How? Contacting the City Council by phone or email. Contact information is here. More information about MHA is available here. Neighbors have requested information on the neighborhood coalition legal appeal currently underway of the MHA Environmental Impact Statement and rezoning. Contact Seattle Fair Growth directly to learn more about the appeal and to donate. CHUV Committee for Smart Growth is not participating in the appeal. CHUV Committee for Smart Growth will update the neighbors of next steps as we learn more. 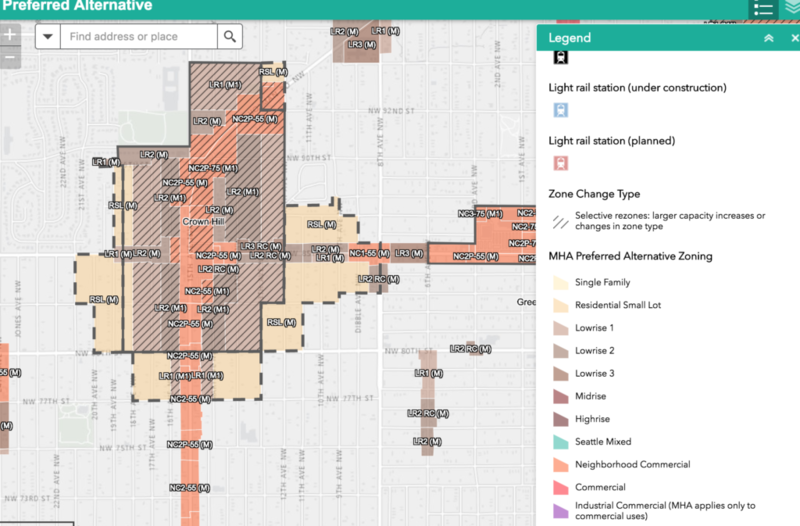 What do Neighbors think about the proposed rezone maps? 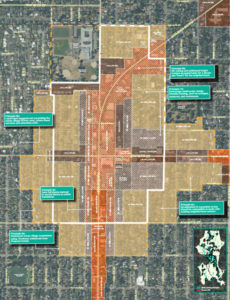 Read the Summary or Full Report of Neighbor Feedback on the draft maps our Committee shared with the City in December. NEW: The City released a summary of neighbor feedback from the November 15th City Council led Design Workshops, including the map, summary of themes, and table notes. Read the full report from the Nov. 5th Neighbor-to-Neighbor Conversation attended by over 50 Neighbors. And the City’s responses to questions neighbors asked here. NEW: Download the input from the HALA Focus Group on the CHUV Zoning Map here. 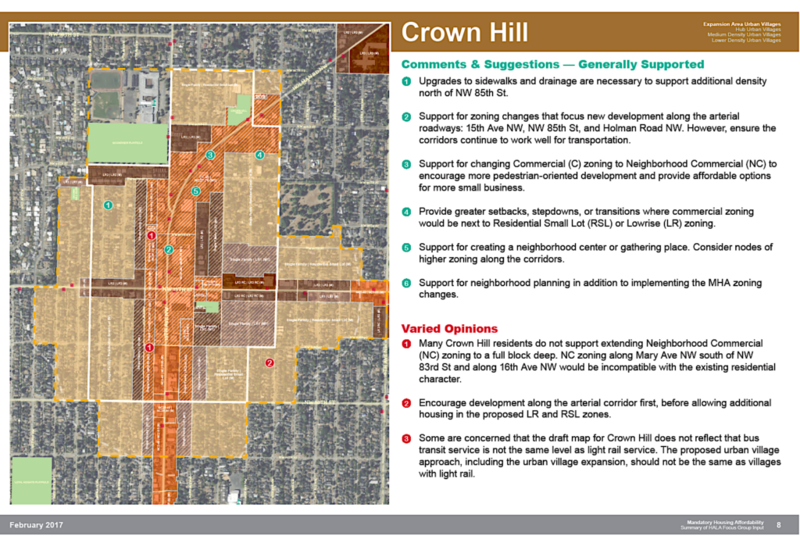 Download the Crown Hill Urban Village first draft rezone map here. Download the Comparison Analysis of Zoning changes prepared by the Committee for Smart Growth here. Download the guide to how to read the map here or view the Video below. See a map of all Proposed Zoning Changes in Urban Villages around the City here.